“Transform an average staircase into an immersive brand experience. It should invite employees to use the staircase and meet colleagues on other floors”. Arttenders received this inquiry from Deloitte for their offices in the Maastoren in Rotterdam. We are working on this new project in collaboration with CBRE. Usually, we do a celebratory announcement of a new client or project (like our interview with CBRE). Eventually, we present the end-result on our website. That’s a wrap! But behind all this is the real work: from acquisition to project management, from working long days to sometimes long nights…we love every single moment of it, but possibly one of the most exciting parts of a new project is when we pitch several designs to a client. Seeing what different artists can do with one particular inquiry is always a treat and a surprise. The assignment for Deloitte is rather difficult because the staircase is a particular space with many safety restrictions. The existing framework of the staircase cannot be modified, so the artists have to deliver a very innovative design. We decided to pitch designs in collaboration with PolyLester and Studio Mo Man Tai. The final decision for the winning design is naturally in hands of the client, oftentimes with added consultation from Arttenders. Both these artists have the power to create immersive experiences that surprise and disrupt the spectator. From a ‘Wow to what’s going on here?’ to the realization that this is a work of art in an unexpected context. PolyLester and Studio Mo Man Tai have their own, distinct signature and they both manage to understand and read our client perfectly. Arttenders aims for a result that will be truly representative of the brand Deloitte. Simultaneously, we hope that the artists will manage to translate the assignment to their own language, thus maintaining their autonomy. We hope that the artists will be able to create a project that they can be proud of and that they will gladly incorporate in their portfolio. The result of this cross-pollination between brand experience and an artists’ approach should result in something that is mutually beneficial and perhaps even into something that exceeds all expectations. Gabriel Lester of PolyLester is a master in creating illusions and a renowned name in the art world. His work comes off as high-brow. But if you look closer, there is a multi-layered and engaging concept. 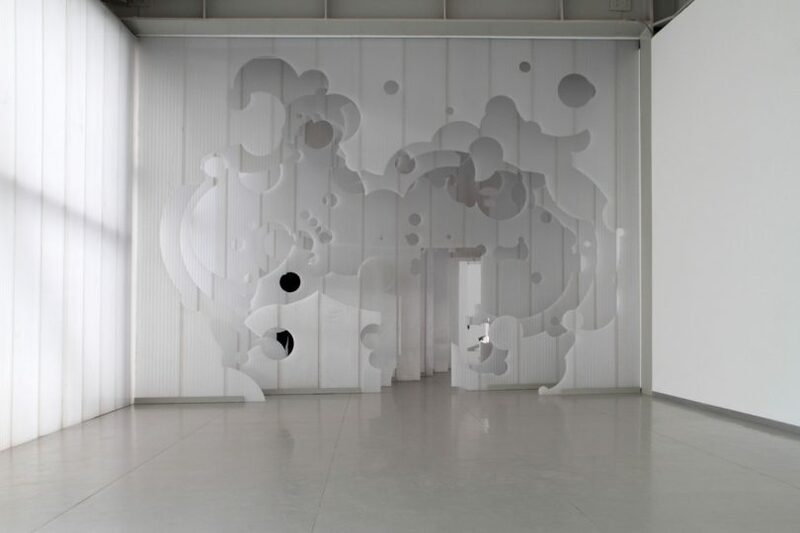 Lester has studied, worked and exhibited films and spatial sculptures all over the world. He graduated from the Rijksacademie in Amsterdam, specializing in visual art, film, and installations. Gabriel Lester has created many commissioned works throughout the world, often times embedded in large scale area development. Nonetheless, he also realized very interesting projects in more modest spaces: regardless of the size or the materials used, capturing and preserving time is always part of the Lester equation as a large and elusive theme. Since 2013 he has been working with Martine Vledder under the name PolyLester. Together they create and design sculptures, architectural interventions, and interiors. Ulrike Jurklies’ designs are bold, playful and enriched by the use of different and (if possible) recycled materials. Her Studio Mo Man Tai creates immersive experiences through vibrant and geometrical shapes that bring a smile to your face and make you grab your camera to share your selfie on Instagram. The studio is an expert in both product and interior design. Through a neat, simple and colorful style Studio Mo Man Tai employs aesthetic and functionality to add value and meaning to people’s life. Stylized and geometrical designs create colorful eye-catcher spaces where the viewer is dragged into unique visual experiences. In 2018, Studio Mo Man Tai was appointed to decorate the windows of the Bijenkorf in Eindhoven, for which they employed textiles made of 100% recycled PET bottles and printed with water-based ink. Because of the different color gradients used during the process every object they created was unique.